Aubrey Schwartz, who won first place in her ninth grade class with a Dutch doe, was overall winner in rabbit showmanship. 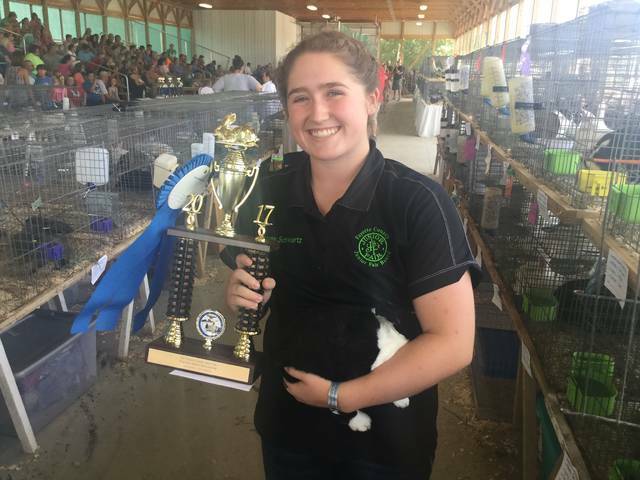 Aubrey Schwartz won first place in her ninth grade rabbit showmanship class and went on to be named best overall rabbit showman in the 2017 Fayette County Junior Fair Rabbit Showmanship. The second place runner-up in overall showmanship was Abigail Mick, third place went to Gretchen Ivers, fourth place to Courtney Dodds, and Laurel Marting was awarded fifth place. The Fayette County Junior Fair rabbit showmanship event in the small animal arena attracted an excited crowd Monday morning at the Fayette County Fair. Members of Fayette County 4-H presented rabbit does and bucks of all varieties to be judged in showmanship. The judge spoke with the 4-H members and quizzed them to see how well they prepared and how they presented themselves during the show. This year’s show lasted for eight hours. Rabbit showmanship was judged by American Rabbit Breeder Association judge Jacinta Taulbee from Hocking County. No stranger to rabbits, Taulbee herself maintains 200 rabbits with her family. Following rounds of judging, Fayette County Junior Fair Board members announced and awarded the first place rabbit showmanship winner in each class division with a trophy. Ribbons were awarded to the second, third, fourth and fifth place winners. The first place winner in the 11th and 12th grade combined rabbit showmanship class was Gretchen Ivers with a mixed breed Harlequin Holland Lop doe. First place winner for the 10th grade class was Courtney Dodds with a mixed breed Lion Head and Mini Lop doe. In the ninth grade class, Aubrey Schwartz placed first with a Dutch doe. Abigail Mick took first place for the eighth grade rabbit showmanship class with a Florida white buck. Kandice Mathews placed first in the seventh grade class with a Mini Lop buck. The sixth grade group was large enough that it was divided into two classes. Morgan Cartwright with a New Zealand doe and Tanner Huff with a Polish buck took first place in each of the two sixth grade classes. For fifth grade, the first place award went to Laurel Marting with a Havana doe. In fourth grade rabbit showmanship, Abreanna Daugherty placed first with a New Zealand doe. The heat was well into the high 80s by mid-afternoon approaching the third grade and novice groups. Both groups were large this year and divided into two classes, with some of the show presenters having a difficult time handling their rabbits because of the heat. In the first division of the third grade class, Leah Marine took first place with a Flemish Giant doe. Halia Mick placed first in the second division of the third grade class with a California doe. In the first division of the novice class, Maggie Gilmore was awarded first place. Maddison Davis placed first in the novice class’s second division with a New Zealand doe. Following the conclusion of the individual class shows, the junior fair moved into judging overall showmanship. The first place winners from each individual class division from novice through 12th grade then re-grouped to be judged for the overall rabbit showmanship award. https://www.recordherald.com/wp-content/uploads/sites/27/2017/07/web1_IMG_12411.jpgAubrey Schwartz, who won first place in her ninth grade class with a Dutch doe, was overall winner in rabbit showmanship.